Hello All, I have a few different pieces but always admired the timeless simple design of the Portugieser. Well an opportunity came up to pick one up and I couldnt say no. My favorite parts are the lacquered dial, the column wheel chronograph and the 150th medallion on the rotor. Last edited by dron_jones; 2 Weeks Ago at 12:40.
jimiwilli and Tony A.H like this. 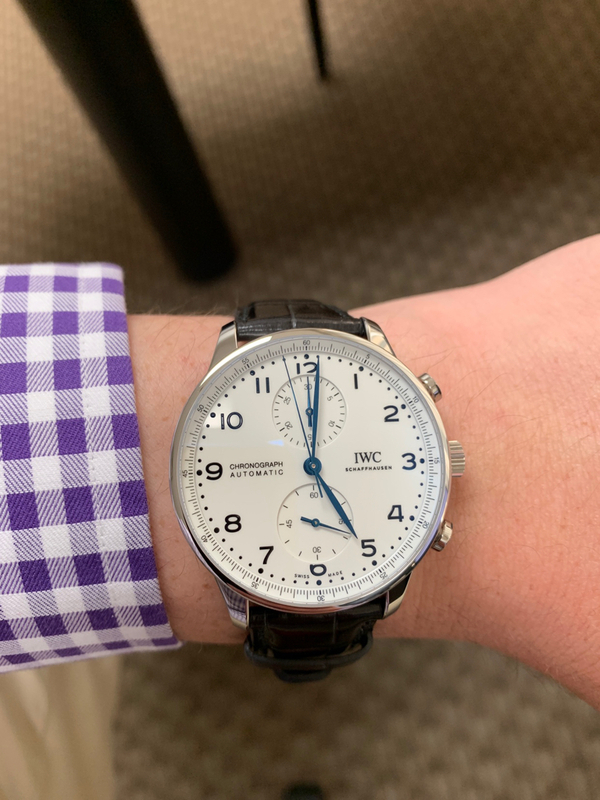 Congrats on the new IWC. Hard not to love the clean dial of a Portuguese. Congrats! Post more pics! It’s a beautiful piece. Wear in top health my friend. Congratulations! It’s a lovely watch ... and with the 150 Year LE, you get an in-house movement too. Congrats that looks great on you! It wears more like watch > 42mm because of the dial. Post a shot of the caseback too!